Heavy-duty Full Metal Construction to Meet Harshest Requirements. Mount Base with Fully Adjustable Quick Detach Lever Lock to Fit on Any Picatinny and Weaver Rail. Includes Swivel Stud Kit for Swivel Stud Mount Application. 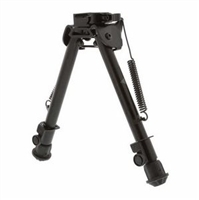 Fully Adjustable Leg with 7 Extension Notches for Most Secured Extension Positions, Further Supported by Lockable Thumb Wheel for Finer, Precision Extension Adjustment. Finger-friendly Push Buttons for Rapid Retraction of Leg Extensions. Foldable Arms with Robust External Spring Tension Control. Unique Non-slip Rubberized Foot Pads for Any Terrain or Surface.